Modern cufflink and tie- bar set in copper signed by the artist, Rebajes. 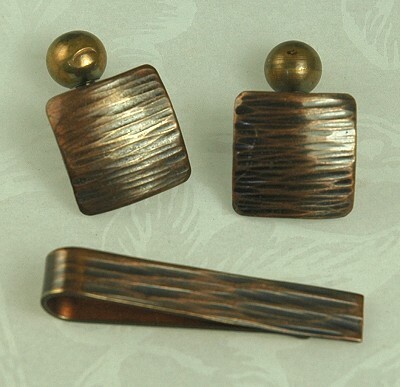 The cufflinks are featured in the book Copper Art Jewelry by Burkholz and Kaplan on page 48. Please Note: This is an original Rebajes piece. This is not one of the new reproductions now being produced! Condition: Excellent vintage. Measurements: Cufflinks: 3/4" square tops. Tie- bar: 1 3/4" long and 3/8" wide.